Owner Pat McGrath, his daughter Lindsay McGrath, right, and other family members designed the Emerging Leaders Program, which is modeled after one used by another local company. The McGrath Family of Dealerships' Emerging Leaders Program teaches talented nonmanagement employees leadership skills while assessing whether they are capable of being part of management someday. "In the spirit of wanting to continue to grow our company, we realized the most important asset is people." 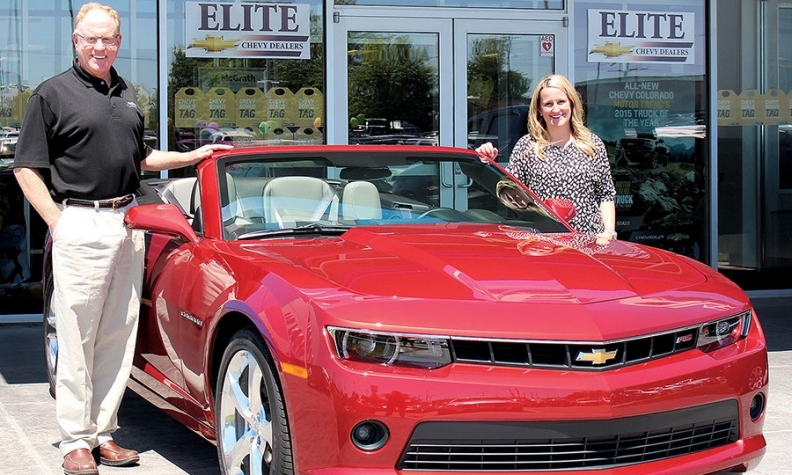 In the fall of 2013, Pat McGrath's dealership group had experienced rapid growth, in part by acquiring more stores. But growing so quickly, "we probably put some people into leadership positions before they were quite ready," McGrath said. For that reason, McGrath, who owns McGrath Family of Dealerships in Cedar Rapids, Iowa, asked his executive team to develop a program to identify talented nonmanagement employees and teach them leadership skills, all the while assessing whether those employees could move into management roles some day. The Emerging Leaders Program was born. It was launched in August 2014. Twenty employees graduated from the 10-month class in May. Of those, 11 have risen to management jobs since. "In the spirit of wanting to continue to grow our company, we realized the most important asset is people," McGrath said. In 2010, McGrath owned two franchised new-vehicle dealerships and two used-only stores, employing about 260 people and selling about 6,000 new and used cars. Today, the McGrath Family of Dealerships owns six franchised new-vehicle dealerships and four used-only stores. All are in eastern Iowa. By year end, McGrath expects to have doubled the number of cars sold in 2010 and to employ 600 people. He wants to add two more franchised dealerships and two more used-only stores by the end of 2020. "We've grown a lot as a company in the last five years, and this is a way to grow people who aren't currently managing people but who have potential," McGrath said of the Emerging Leaders Program. His daughter, Lindsay McGrath, and two other family members designed the Emerging Leaders Program, which she modeled after one used by another company in town. To be accepted in the program, an employee needs a manager's recommendation and should demonstrate a willingness to be coached and be a team player. Fifty employees applied for the second class, which started in August. Only 28 were accepted. There are four pillars to the program: Customer service, communication, corporate operations and competitive greatness. In customer service, the participants study building customer loyalty. They visit various McGrath stores rotating through the departments to experience customer service in all areas and devise ways to improve it, Lindsay McGrath said. The communication pillar improves openness between employees and between employees and managers, Pat McGrath said. Lindsay McGrath said: "We had them brainstorm processes we could put in place where we could more effectively communicate issues throughout the company. Out of that came our monthly newsletter that goes out to everyone via email." The corporate component centered on culture and business goals. The group took a tour of a locally based national leasing company to examine that company's culture. "We wanted the emerging leaders to learn the cohesiveness and teamwork there," Lindsay McGrath said. "No matter what department they worked in at that company, they all worked together and that's a culture we want to cultivate." The McGraths shared company results and their growth goals with the participants, too, "so that everyone understood that by the end of 2020, here's what this company wants to look like," Pat McGrath said. "The idea behind Emerging Leaders is, as we grow, those people will be highly considered for promotions and that's why we wanted to share our vision, so they know there's a future for them." Competitive greatness is taught by guest speakers. One was Tom Brands, a former U.S. Olympic team wrestler and now the head coach of the University of Iowa's wrestling team. Brands is "an extreme of competitive greatness," Pat McGrath said. Program graduate Jason Stratton rose from his job as a special finance salesperson to his current job as the used-car sales manager at Pat McGrath Chrysler-Dodge-Jeep-Ram. He credits the program for his growth.